Researchers from the Massachusetts Institute of Technology recently demonstrated a rapid-recharging system, designed to improve electric vehicles’ operation. Their project aims to change public perceptions about the practicality of such vehicles. The team’s objective is to recharge an electric car in less than 30 minutes, without severely reducing the operating lifetime of the batteries or causing other problems. The project, conducted by the Electric Vehicle Team from the Massachusetts Institute of Technology (MIT), started almost a year ago, and has gathered worldwide interest: Japanese manufacturer Nissan is considering implementing the system in its Nissan Leaf. Lennon Rodgers, a doctoral student in mechanical engineering and a member of the MIT Electric Vehicle Team, recently presented a paper on the team’s tests at the 12th International Conference on Advanced Vehicle and Tire Technologies in Montreal. The paper was co-authored by fellow team members Radu Gogoana, Paul Karplus, and Michael Nawrot. Rapid charging, also known as Level III charging, requires much higher voltages and currents than what is supplied by conventional household circuits. Currently, there is just one station that complies with the standard in the U.S. It is located in Portland, Oregon. The mark “Level III” was invented to distinguish it from 110 volt household current (Level I), capable of recharging an electric car’s batteries overnight, and 220 volt current (Level II), available in European countries. Almost all electric vehicles require large amounts of power. Therefore, plans are to create recharge centers so people will not need to convert their home garages into micro power stations. This latest system could be installed in central recharging stations – similar to today’s gas stations – providing drivers fast and easy recharging solutions. The problem most people have with such technologies is the dependency upon power outlets, required long recharge times, and multiple necessary recharging stops during one trip. Hopefully, this new technology could help change the public image of electric, green vehicles. While the technology behind rapid charging has been available for some time, few tests were carried out. The team’s results present interesting answers to questions raised by researchers. For instance, they found that the chemistry used in lithium-ion batteries manufactured by A123 Systems is the best suited for rapid charging. These batteries have been selected for several planned new electric vehicles including cars from Fisker Automotive and buses and trucks from Daimler and Navistar. The tests performed included a motorcycle converted to operate solely on electric power. It reached a more than 80 percent charge within 10 minutes. 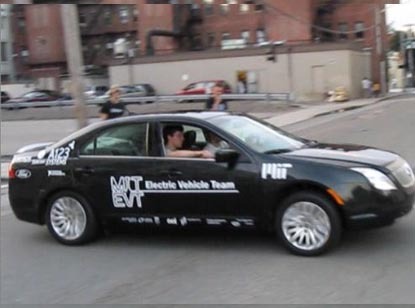 The MIT team has also completed the conversion of a 2010 Mercury Milan hybrid into a purely electric vehicle. They hope to use the car for the testing of rapid charging technology, although they are still looking for funding to get the necessary equipment. Kristen Helsel, vice president of EV Solutions for Aerovironment, a company that makes charging systems for electric vehicles, said about the implementation of the new technology: “I don’t expect it in the near term. There are still multiple designs under consideration. Better batteries are coming, and because of that the ability to charge at any level is going to be a constantly evolving thing. We need to continually evolve the technology, and to better understand the effects of different things.” Therefore, she believes it is unlikely anyone will start installing rapid-charging stations in the U.S. in the near future. However, the rapid charging technology will surely play a major role in that future: “There’s all sorts of good work that needs to be done,” she concludes. According to Rodgers, car designers face a dilemma: They can include larger battery packs that provide longer driving ranges (but are more difficult to recharge rapidly), or smaller packs that give shorter ranges (but cost less and are easier to charge rapidly). Therefore, the analysis of battery performance is crucial in evaluating the best charging solution. He suggests using a large battery pack instead directly charging the vehicle from the grid; thus, the recharge devices will be use low-cost, off-peak power. Such device will essentially use rapid transfer to charge the vehicle’s batteries. Exactly to face these battery dilemas, the hybrid systems are the better response to this intermediary condition. The more the carbon nanotube technology evolutes better will be the batteries cathodes and charge time range.